UPDATE: I met with District 202 Superintendent Dr. Witherspoon this morning. He agreed that my that my goals are very feasible, except we would have some trouble finding a room for the Snooz Zone. I am excited to announce that I will be running for Student Representative next week. ETHS is a great school, and I would be honored to represent the student body. My goal as Student Representative is to reduce stress. First, I would like to institute a no homework weekend, once per quarter for all non-AP classes. This would give students more time to participate in extracurricular activities. I also would like to give students the option to clear detentions and referrals by participating in clubs, or doing community service. Another issue affecting us as students is our lack of adequate sleep. I would like to mitigate this by creating a new room for students to go during their free periods: The Snooz Zone. Tacky? I know, but why shouldn’t students be able to get sleep during free periods? ETHS should allow students to take quick powernaps during their free periods. I like many students, enjoy eating out at Evanston area restaurants. Northwestern Students get discounts at many of these businesses. I believe that ETHS students should be entitled to these same discounts, and I will work hard to get Wildcat discounts extended to ETHS students. My final goal as Student Rep would be to provide alternative education to students. I propose having an interesting speaker come to ETHS once per quarter to speak on any topic (Like TED). Students would be allowed to miss class to attend the presentation. This will allow students to learn about topics not normally taught in school. I’m very passionate about improving the ETHS community with these new programs and policies. I’m a realist, I realize that I won’t be able to put soda in the water fountains, but, I am confident that I would be able to successfully make these changes. 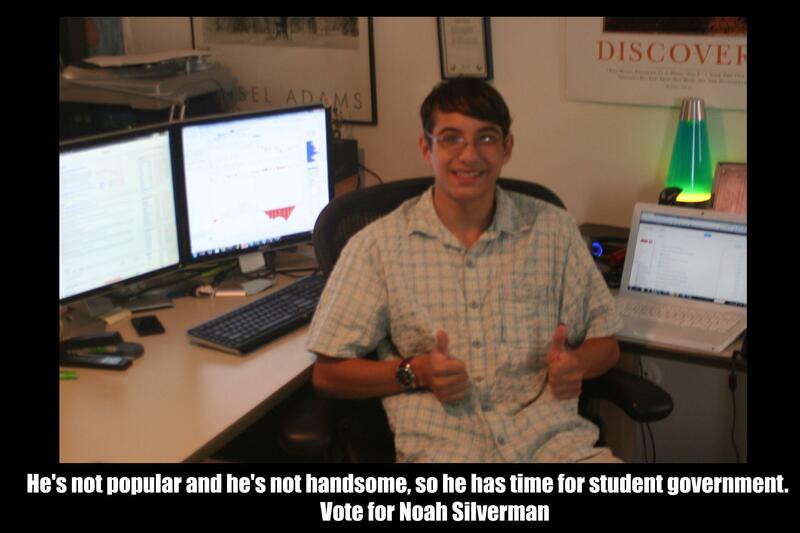 I strongly encourage you to vote for Student Representative next week. whether it be for me, or any other candidate.